I am a big fan of seeing the reaction of a person coming in contact with 300V, seeing few hundred Joules capacitor discharge in 100us so I build this simple FlyBack converter to play with. The FlyBack converter consist of a Mosfet switch driven directly by a pic controller with a On time relative to VCC. The Mosfet rise time is not too bad, in the 40ns range. A resistor feedback divider coupled with the PIC’s comparator to detect if desired output voltage is reached before every switching cycle. The output ground is not isolate. There are some upgrades in the works because some users would like a clean output for vacuum tube audio and photo multiplier application. These are drive the converter in resonant mode by detecting zero crossing with the comparator in order to compensate for the ~pour couplings factor of the transformer causing noise and an optional output filter. Also a potentiometer adjustable output voltage from ~0-1250V. 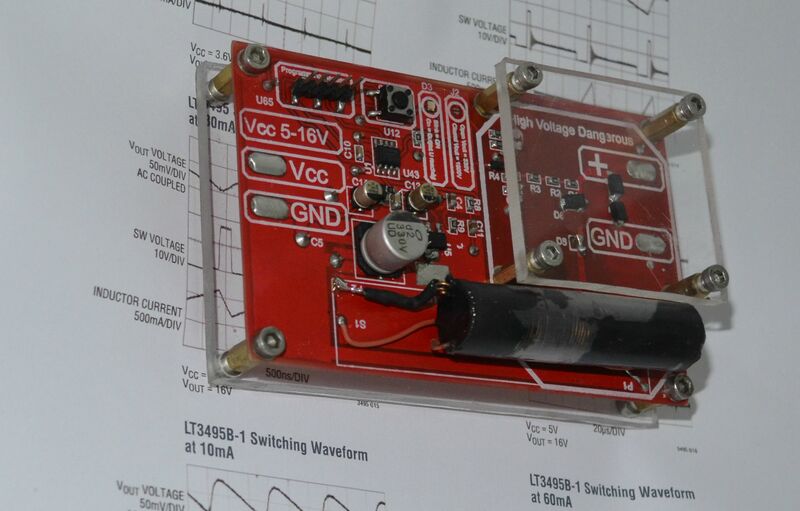 And controllable output voltage with an RC type PWM signal. (can you imagine a RC receiver with the power supply and a battery HAHAHAHAHA) Upgrading the PIC12F to something with more pins to accommodate the extra features. Its a royer oscillator (very commonly used to drive flyback transformers with re-wound primary for HV supplies) and a divider and op-amp for voltage regulation and a few transistors providing current limiting on the input side. Though I do like the pull up resistors and diodes to pull down the mosfet gates instead of the typical resistor/zener to the opposite leg of the oscillator approach. What is the transformer in the converter in the original post sourced from? It looks similar to a tazer/stun gun transformer. What is the transformer in the converter in the original post sourced from? It's homemade, ferrite core with 1:33 winding ratio, the magnetic path is not closed hence high leakage induction, which is fine as long as it run in resonant mode. The only reason why I did this that way was because it takes us ~6 weeks to get parts down here. Just 5 days to go! !